The Annual Catholic Appeal relates our Easter theme: Life in Christ. Life in Christ as we have seen so far means listening to God, opening ourselves to the abundance of his mercy and his Word. Today we focus on Life in Christ as a walk with Jesus. In the Gospel we see two disciples walking to a village called Emmaus. They feel discouraged, even heartbroken because of Jesus' death. A stranger, a pilgrim, joins them. Like us they do not recognize the presence of Jesus, yet he walks with them. The walk with Jesus involves the Scriptures. Last week I invited you to my Take the Plunge into life in the Parish. Like the disciples on the road to Emmaus our hearts will burn within us. Like them we will see how Jesus fulfills the Jewish prophecies, psalms and history. But there's more, much more. When they invite the pilgrim into their home, he takes bread, says the blessing, breaks and gives it to them. They then recognize Jesus. He disappears from sight because of his true presence now in the Eucharist, the Mass. So Word and Sacrament; the Bible and the Mass - both are essential to our walk with Jesus. And the Gospel shows another detail. The two disciples run back to the Apostles. They hear, "The Lord has truly been raised and has appeared to Simon." In our walk with Jesus we need Simon Peter and the Apostles. For us today that means the pope and bishops. We are Christians in union with Pope Francis and Archbishop Sartain..." Our walk with Jesus includes union with the pope and bishops. With that in mind I turn our attention to the Annual Catholic Appeal. It supports the Archbishop and all the ministries he supervises. The Bible and the Eucharist sustain us; the pope and bishops keep us from meandering and getting lost. So the Annual Appeal is yearly a part of our walk with Jesus. The Appeal calls parishioners to personally give to the Appeal and to be passionate about ministry in our parishes and Archdiocese. As usual our witness speaker will report on our call this year with a presentation next week, annually we are invited to give to the Annual Catholic Appeal of the Archdiocese. The annual Catholic Appeal is a way that we show that we are willing to do the work of Jesus, to share our gifts. Recently our Archbishop sent a brochure and a letter to each registered parishioner in the Archdiocese asking for a pledge. A letter from me was also sent out this weekend. The money raised this year will provide funding for the 60 ministries. Our goal this year is located on the thermometer. Last year we went over the goal with your generosity. You have certainly shown your support since I came to this parish, and I pray that you will always continue your commitment to any Bishop and any pastor as well and I ask you to please be open to this invitation. At all the masses this week I want to invite everyone to complete a pledge envelope today or in the next four weeks. I hope that each adult who attends Mass here will read over and complete an envelope and make a pledge. Every gift, no matter the amount, is gratefully received. If you are not able to make a pledge, write that on the envelope that you will pray for the Appeal…and please complete and return an envelope with your information on it. Please include the parish number, St. Aloysius is #52 and Our Lady of Lourdes is #53. It is the completed returned envelope that tells the system to stop additional mailings to your home…..so take a few minutes now to fill out your pledge envelope, and then put your completed pledge envelope in the Offertory Collection today or in the near future. I want to thank you in advance for your continuing generosity and commitment to the Catholic Church in Western Washington. 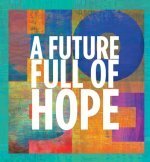 Our Theme this year is a future full of hope. and when we come together we create, With Archbishop Sartain I want to publicly again ask all parishioners to participate in the Annual Catholic Appeal. I would like to invite every couple or adult single to fill out the envelope and to make a pledge and give a donation I want to thank those early birds who last week already mailed in their generous contributions. Last year the average pledge was $368.00 in the Archdiocese.It is up to us to support the Archdiocesan programs. If you have not filled out an envelope please take time to do so. I would like to ask for 100% participation this year. It is recommended in Stewardship that one give 5% of one’s annual income back to God by giving to the parish. And if possible I’d like to ask you to consider to give at least 1% of your income to the Annual Appeal. 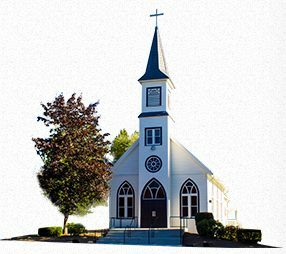 Many churches ask for 10% as one’s stewardship. We are hoping again that moneys over our goal will come to the parish and I would like to designate them to a total refurbish of the Kitchen. That will have a hefty cost. That was our goal last year but we need more to undertake such a big project and both parishes will profit from this project. Please help us make the updating project possible. Your donations help the diocese so very much, but even more the money that returns to the parish helps us to do things that would be impossible, so please help us. Thank you again for your generosity. Jesus continues to invite us as he waits for us to realize that our old way of being doesn’t work and we are called to serve, putting our gifts at the service of others and the church. The posters and brochures and the mailings all remind us of a call to respond. 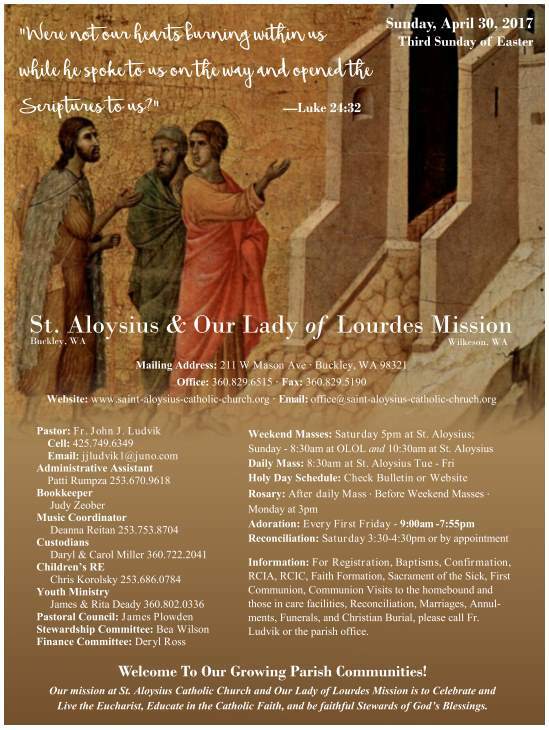 We are not just members of Our Lady of Lourdes and St. Aloysius. We are a part of the Archdiocese, and today we are asking that you defy some of the values of our culture and as Jesus’ disciples we call you instead to serve others and the Church. Dare to share! Begin by making a pledge to this year’s appeal. You have an opportunity to do tremendous good. Life is a winding, multi-stage journey made up of many smaller journeys. It is a wonderful gift of God’s Spirit to have the sense of being accompanied on the journey, of being led by the Spirit, of having a sense of direction in life. All of this is only possible through our own personal yeses, and our willingness to be open to the accompanying presence of the Lord. “You’ll never walk alone when you walk with God” is an important truth. The only real sin for the Christian is not to have hope. Because of Jesus we already have the victory. We are a risen people, a people of power, and a people to whom Jesus has entrusted full authority over all the power of the evil one. Again, all of this makes no difference whatever, unless we personally take possession of what Jesus offers us and makes possible for us. Again and again and again we are called on to repeat our personal YES of trust and commitment. The response the Lord is most seeking is our YES of here and now.